From breakthrough technology to eye-raising hashtags, there is no one better than TaylorMade when it comes to revamping that fairway wood. On the map in 2012 with the successful RocketBallz and its game-changing "Speed Pocket" design, TaylorMade moved through the gears by tinkering with the centre of gravity of its RBZ Stage 2, SLDR, SLDR S and JetSpeed in many different clubhead designs to suit different golfers. Now we have arrived at AeroBurner, a club that during our testing (15-degree, three-wood) dropped backspin by some 500 RPM in comparison to other TaylorMade fairway woods - crucial for length. The AeroBurner fairway wood achieves added speed from an improved open channel "Speed Pocket" design, which not only creates more flex from the face but increases the size of the sweetspot and reduces spin. 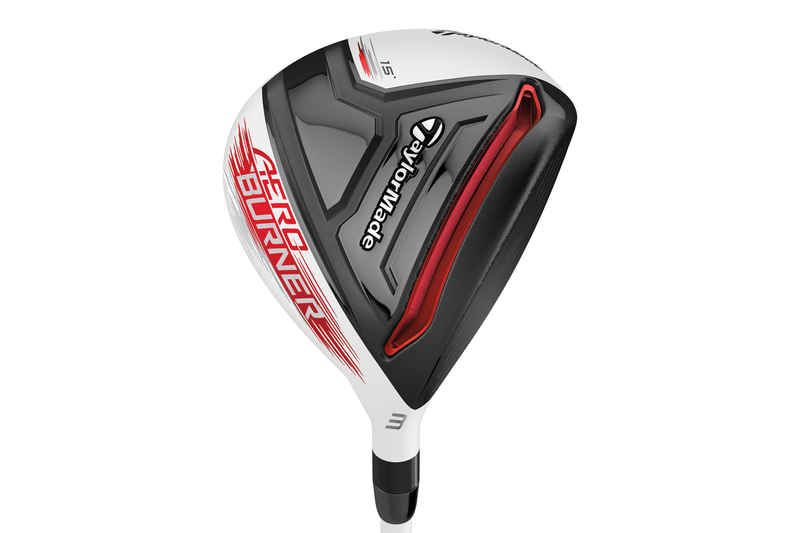 According to TaylorMade, the AeroBurner fairway wood generates twice as much flex off the face as the former JetSpeed fairway wood. This was evident in our averages with 232 yards of carry and 253 yards total distance. With the former JetSpeed, total distance only reached 238 yards. Another advantage of the new design is the addition of an insert to ensure no debris gets stuck inside the clubhead, which has often been a problem with clubs such as the RocketBallz. In terms of appearance, this 170cc fairway wood has a shallow face and a distinctive raised centre crown that serves to keep airflow attached longer, which in turn reduces drag. TaylorMade tested more than 125 heads in more than 400 aerodynamic runs in the wind tunnel to address the air flow situated best over the crown. As a result, the company produced its most aerodynamic clubhead ever. The club also features a new "aero" fin that reduces drag to ensure it moves through the air as quickly as possible. It is also very easy to align whether off a tee peg or on the deck with the AeroBurner logo situated in the front centre of the clubhead, and the striking matte finish contrasting with black face. AeroBurner fairway woods come in 3 (15 degree), 3HL (16.5 degree), 5 (18 degree), 5HL (21 degree) and 7 wood (23 degree) options with a Matrix Ozil White Tie 70X4 shaft. Quite possibly the longest fairway wood in the game today and easy to see why a plethora of Tour professionals are sporting red and white headcovers this season. Solid clubhead numbers were noted from the three-wood offering, as well as tight offline dispersion throughout the testing – perfect for those tree-lined par four holes. It felt easy to nip cleanly off a bare lie and even sweeter off a tee peg, while the beautiful matte white appearance, compact head, suitable alignment and flexible debris cover adds to its appeal. The standard shaft offering is light but by no means uncontrollable, as is the case of the AeroBurner driver. Of course, £200 is not cheap for a fairway wood, so it will likely have a few detractors, but you cannot put a price on having more eagle putts. Just try not to three putt.